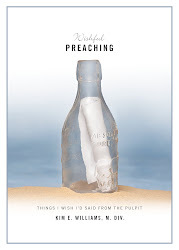 Wishful Preaching: Like You Have A Clue WWJD!? Like You Have A Clue WWJD!? It isn't as popular as it was a few years ago, but I still hear it said, “What would Jesus do?” The intention is innocent enough and the catchy phrase certainly sticks with you. The initials make a great bumper sticker. WWJD. It is a good question and one we can certainly ponder. Asking this question about Jesus, about anyone really, is the gate that enters into the realm of that person’s core make up. The question, “What would s/he do?” always implies other questions, “What motivates this person? What is his/her decision framework, or moral compass, made of?” In short, if we are to take a stab at knowing what someone would do in a particular situation, we need to really know them, and the better we know the, the better the odds are we could predict what they would do. Perhaps the best way to know what, or who, someone is, is to ‘walk a mile in their moccasins,’ to live as they lived – to be them. Here’s the problem: Can we ever really be Jesus, even for a moment? As much as Jesus was fully human, he was also fully divine. We are not. We are imperfect, struggling, fractured human beings. We can imagine what it might be like to be fully human/divine, but can we really understand what it was like to be Jesus? There is an even deeper problem. Jesus had a very specific life ministry. He was born, grew and accepted a dramatic calling directly from God: Love people, minister to them, make and teach disciples, and (here’s the problem) give your life for the redemption of humanity. Last time I checked, that mission, that ministry was done. We not only can’t be Jesus, we shouldn't try to be Jesus. Asking WWJD may be the wrong question. We need a better question. What if we focused on being ourselves? What if each of us accepted that the goal of our spiritual life is to be the very best “me” he or she could be? What if growing spiritually wasn’t about being or behaving like someone else – but rather was about being you? Then the better questions would be, “What would Jesus have me do? What is God’s will for me? What does Jesus want ME to do?” This life, this gift of personal mission, can certainly learn from Jesus’ teachings and choices, AND I need to figure out what I need to do to fulfill that mission. My purpose and my spiritual journey are tied to my choices about my life decisions. What if we asked, "What would Jesus want me to do?" I agree with you KW, however I doubt anyone will ever remember WWJWMTD. Besides - that's too many characters for a bumpersticker on my Mini. Seriously - I like WWJWMTD. MUCH the better question! I like it.